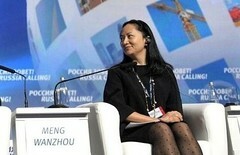 Huawei’s Chief Financial Officer, Meng Wanzhou, has appeared in court in Canada today. The high-level executive was at the Supreme Court of British Columbia for her bail hearing where she listened to the reasons behind her recent arrest. American officials want Meng to be extradited to the US to face charges of offenses relating to fraud. Meng Wanzhou, Huawei’s Chief Financial Officer and daughter of the company’s founder, has appeared at a bail hearing held at the Supreme Court of British Columbia. A prosecutor for the Canadian government has argued that the executive should be denied bail on the grounds that she is likely to flee the country, based on a combination of her personal wealth and the fact she could face heavy prison sentences in the US. Her defense has countered that her financial status should not affect bail and that she would not break a court order. The executive was arrested in Vancouver on December 1, with a New York Court issuing the arrest warrant. Meng has been accused of being involved in fraudulent activity, by allegedly circumventing US sanctions against Iran with the use of what is claimed to be a Huawei subsidiary, Skycom. The Huawei CFO has insisted that Skycom and Huawei are not part of the same company. If Meng was found guilty of the charges of defrauding international financial institutions, she would face up to 30 years in prison for each charge. This is yet another law-related/security issue the Chinese company has had to face recently. A source in the firm has claimed US$2 billion will be spent on clearing up and fixing security concerns about its hardware being sold in certain markets. The tech giant also took a further step in trying to counter current negative press by offering a bold statement saying that Huawei could exceed US$100 billion in revenue for 2018.